MELBOURNE, Australia (AP) — This was quite a return for Serena Williams. Almost as if she never left. In her first match at the Australian Open since winning the 2017 title while pregnant — and her first official match anywhere since a loss in the chaotic U.S. Open final last September — Williams looked to be at her dominant best, overpowering Tatjana Maria 6-0, 6-2 in the first round Tuesday. She hadn’t dipped her toe in Grand Slam waters since New York, where everything devolved after Williams was warned for getting coaching, then docked a point for breaking a racket and eventually docked a game for calling the chair umpire “a thief” during the final. Truth be told, the match against Maria was not much of a test for Williams, given that the 74th-ranked German entered with an 11-15 record in first-round matches at Grand Slam tournaments, only once has made it as far as the third round at any major and owns a total of one career WTA title after a dozen years on the tour. Williams, meanwhile, is pursuing an eighth title in Melbourne and 24th Slam singles trophy overall, which would equal Margaret Court — whose career spanned the amateur and professional eras — for the most in tennis history. Williams needed all of 18 minutes to wrap up the first set, ceding just five of 29 points along the way. The American, a former No. 1 who is seeded 16th on account of playing only 24 matches in 2018, never faced a single break point and compiled a 22-7 edge in winners. The two players have homes near each other in a gated community in Florida — “We do sometimes barbecue together,” Maria said — and their daughters — Williams’ is 16 months old; Maria’s is 5 years old — share play dates. Other seeded winners Tuesday included No. 4 Naomi Osaka, No. 7 Karolina Pliskova, No. 12 Elise Mertens, No. 13 Anastasija Sevastova, No. 17 Madison Keys and No. 18 Garbine Muguruza among the women, plus No. 4 Alexander Zverev, No. 8 Kei Nishikori, No. 11 Borna Coric and No. 12 Fabio Fognini among the men. 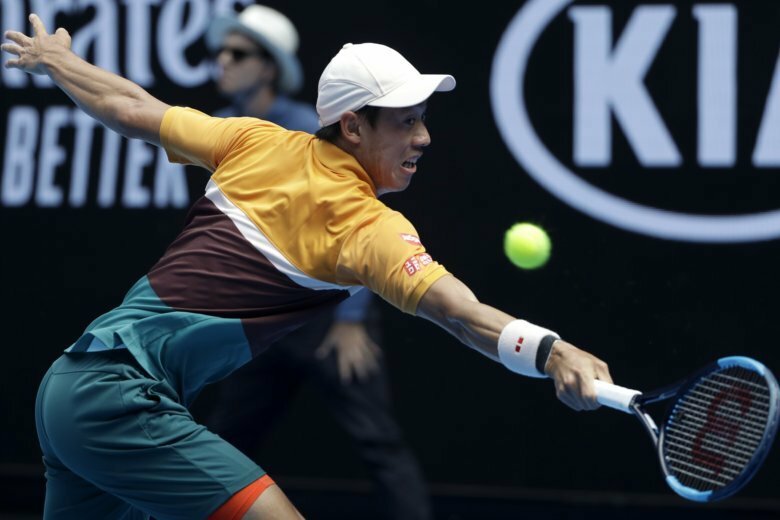 Both Nishikori, who had dropped the opening two sets against qualifier Kamil Majchrzak, and Fognini advanced when their opponents retired mid-match. French Open finalist Dominic Thiem went the distance against Benoit Paire before wrapping up a 6-4, 6-3, 5-7, 1-6, 6-3 win just after 2 a.m.
Williams’ older sister, Venus, is unseeded at a major for the first time in five years and she was a game from a first-round exit before coming all the way back to eliminate 25th-seeded Mihaela Buzarnescu 6-7 (3), 7-6 (3), 6-2. She is a seven-time major champion and a two-time runner-up in Australia but is currently ranked only 36th. The tournament’s two No. 1 seeds, Novak Djokovic and Simona Halep, played at night and both won — although in contrasting fashion. Djokovic eliminated Mitchell Krueger of the U.S. 6-3, 6-2, 6-2, while Halep trailed by a set and a break before coming back to beat Kaia Kanepi 6-7 (2), 6-4, 6-2 and avoid becoming the first top-seeded woman in 40 years to lose her opening match at the Australian Open. Krueger was part of a rough day for American men, who went 1-5 Tuesday; Ryan Harrison had the lone victory. Two years ago, no one knew Serena Williams was carrying her child while winning her 23rd major to break a tie with Steffi Graf for the most in the half-century professional era. Her baby, Olympia, was born on Sept. 1, 2017, and Williams was off the tour until last March. Her Grand Slam return came at the 2018 French Open, where she reached the fourth round before withdrawing with an injured chest muscle, and was followed by runner-up showings at Wimbledon and the U.S. Open. Because of a health scare after giving birth, Serena wears compression stockings during matches to try to make sure she doesn’t get blood clots again. On a humid afternoon with the temperature topping 90 degrees (32 Celsius) Tuesday, she wore a green leotard of sorts — she called it a “Serena-tard” — and while her dangerous serve produced only two aces, her other, considerable, tools were in working order. When she returned to the tour last season, she often was asked to rate herself in comparison to how good she played in the past. The younger Williams sister has no interest in that sort of comparison now.